What she hasn’t done might be easier to list! Lauryn Williams is certainly one of the most decorated Miami Hurricanes athletes of all-time: Olympian, All-American, record-setter and scholar-athlete. Having set numerous state and school records at Rochester (PA) High School, Lauryn came to Coral Gables and she rewrote the Hurricanes record books and represented Miami with distinction internationally. As a freshman, she was named the 2002 Big East Indoor Most Outstanding Track Athlete after recording victories in the 60-meters and 200-meters, and also winning the 100-meters at the Big East Outdoor Championships. She won a gold medal at the World Junior Championships in Kingston, Jamaica in the 100-meters, was the USA Junior National Champion in the 100-meters and became the first Hurricane to earn All-American honors in the 60-meters at the NCAA Indoor Championships. She also was named an All-American in the 100-meters at the NCAA Outdoor Championships. In 2003, she was the Big East champion in the 100-meters, ran the first leg of the Canes 4x100-meter relay that won the Big East Outdoor Championship, and she won the 60-meters Big East Indoor Championship. She was named an All-American in the 60-meters, 100-meters and 4x100-meter relay. At the 2003 Pan Am Games, Lauryn was a gold medalist in the 100-meters and the 4x100-meter relay. Her 2004 season was one to behold as Williams as she became the only woman in Big East history to win three consecutive 100-meters titles, also claiming titles in the 60-meters and the 4x100-meter relay to be named 2004 Big East Outdoor Most Outstanding Track Athlete. Lauryn would win the 100-meters at The Penn Relays, then claimed the NCAA Championship in the 100-meters with a time of 10.97 seconds, the second fastest time in the World that year. To top off her year, she captured the Silver Medal in the 100-meters at the 2004 Summer Olympic Games in Athens, Greece. For her Miami career, Lauryn was a nine-time All-American, eleven-time Big East Champion, and left the school with record times in the indoor 55-meters, indoor 60-meters, indoor 200-meters, outdoor 100-meters, outdoor 200-meters and on the school's 4x100-meter and 4x200-meter teams. A member of Iron Arrow, the highest honor one can attain at the University, she graduated Miami with a B.B.A in Finance. She continued her track career by competing in the 2008 Beijing Olympics and winning a Gold Medal as a member of the USA's winning 4x100-meter team in the 2012 London Olympics. 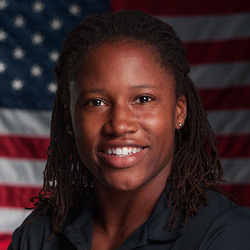 Lauryn then turned her attention to bobsledding and won a Silver Medal in two-woman bobsled at the 2014 Sochi Olympic Games, becoming the first American woman and only the sixth woman in history, to win medals in both the Summer and Winter Olympic Games.